This week's SmackDown Live is the first SmackDown after Elimination Chamber 2019 on Feb. 17, 2019! Press F5 or refresh for updates during the show. Smackdown opens with Shane McMahon hitting the ring. They show a brief recap of the WWE Championship match two nights ago, and then he takes a mic. "Thank you for that, what's up, New Orleans? As you can see, what an amazing main event we have for you tonight. How amazing was the debut of Johnny Gargano, Tomasso Ciampa, Aleister Black, and of course, Ricochet. They're going to be here again tonight, and a lot more." Miz comes out. "Look, I know I said I wasn't going to do this, but I haven't slept in 48 hours, I haven't eaten. Look, two nights ago, I lost the Smackdown Tag Team Championships. That's been 48 sleepless hours for me. I know you took a chance on me, I know my reputation, and you took a chance on me, and that means so much to me. Shane, I have a confession to make: I used you. I knew you'd relate to how I feel about my dad, it's everything I live for, and I knew you could relate. And when I fell injured at Best in the World, you selflessly took my place. You revealed that your dream was to be a tag team champion, and I can relate, when I win a title, I make it the most relevant, most prestigious championship in the WWE. And then, two days later, you surprised me by bringing out my dad. And as the crowd chanted, 'Mr. Miz', my dad told me that he was proud of me, and that he loved me. And that was the first time that I have ever heard him say that. And that was... that was the best moment of my career, and one of the greatest moments of my life. And it was because of you. So thank you. But then two days ago, in our first title defense, I let you down, and I am so sorry. Now, I can't change the past, but I can control the future. And I know there are no more automatic rematch clauses, but you're Shane McMahon. And if anyone can make a rematch with the best tag team in the world and The Usos, it is you, Shane. Listen to the crowd, Shane. I know they want it, I know you want it. Rematch, rematch!" The Usos come out. "Whoa, whoa, whoa, whoa, whoa, whoa, whoa, whoa! Whoa! Whoa! Whoa! Holy cow. From the sounds of it, uce, it sounds like the WWE Universe want a rematch between Shane and the Miz vs. the brand new Smackdown Live Tag Team Champions! But this is what we know: there's no more automatic rematch clauses. But Shane, if you could dig down deep and forgive your partner, then we'll give you one more chance to become the tag team champions of the world. But Shane, there's only one reason you don't want this rematch. Let's keep it real: your boy, Miz, is a joke. These are facts. Your boy, Miz, is a failure, he's a fraud, he wants to be an a-list star with c-list skills. He said it himself, he's a crybaby." Shane: "With all due respect, you don't disrespect my partner. The rematch is on! And it's happening in your hometown, Cleveland, Ohio, at Fastlane!" Miz: "We're taking back our tag team championships, and that is awesome!" Lockup, Andrade with an arm wrench, Black with a cover for zero, misses a kick, lockup, Andrade with a rear waistlock, Black with a side headlock, Andrade whips out, double axe handle, stomps in the corner, chop to the chest, whip, knee in the corner for two, chop, whip, misses a knee, falls to the floor, Almas with a suicide dive, backflips into the middle of the ring instead, commercial. Back on air, trading forearms, Black with a pair of clotheslines, blocks a kick, hits one, leg sweep, knee, Andrade presses Black to the floor, follows, rolls Black into the ring, hammerlock, DDT, blocked, Black with a rollup for two, boot in the corner, blocked, Black with an enziguri, kick, German with a bridge for two, Andrade with kicks, tosses Black to the corner, running knees to the face for two, hammerlock DDT, reversed into snake eyes, Black Mass for three. The former DIY are backstage. Kayla asks if they can keep up their momentum tonight. Ciampa says they've made a career out of defying expectations, while Gargano notes how they've come back together a year after fighting in the same arena. The Bar run in and belittle them as nobodies. DIY challenge them, and The Bar just laugh in response. Jeff Hardy tells AJ Styles that they need to work together tonight. Kofi walks in with a "pancake branch" to extend. Ciampa and Sheamus start off, lockup, Sheamus presses Ciampa to the corner, face wash, Ciampa with a face wash, rear waistlock, Sheamus with European uppercuts, Ciampa with boots, running big boot, Cesaro in, asks for Gargano, Gargano in, Cesaro with a rear waistlock takedown, wrenches an arm, Gargano rolls through, hurricanrana, rollup for one, Cesaro with a European uppercut, Sheamus in, stomp in the ropes, Cesaro in, whip, misses a double clothesline, Ciampa in, Gargano with boots to both opponents, Ciampa with a knee to Cesaro, Gargano with a suicide dive to Sheamus, Ciampa leaps at Cesaro from the apron, Cesaro catches him and hits a tilt-a-whirl backbreaker, commercial. Back on air, Cesaro has Ciampa in a chinlock, Ciampa with a jaw breaker, boot from the corner, goes off the top rope, Cesaro with a European uppercut, Sheamus in, knocks Gargano off the top rope, Ciampa goes for a tag before he realizes, Sheamus with a knee, sets Ciampa up top, punches to the back, fireman's carry, Ciampa with elbows, sunset flip, Sheamus lands on Ciampa's knee, hurting both of them, double tag, Gargano with a springboard kick, hurricanrana to the floor, leaps to the apron, goot, senton to Sheamus, blocks a Cesaro charge and sends him into the barricade, hurricanrana to Cesaro into the ring skirt, slingshot DDT for two, Cesaro shoves Gargano to the corner, Gargano with a kick, head scissors into the Gargano Escape, Cesaro to his feet, breaks the hold with a backbreaker, Sheamus in, Cesaro with another backbreaker, Sheamus with a knee from the top rope for two as Ciampa breaks the count, both members of The Bar toss him to the floor, Irish Curse to Gargano for two, Sheamus drags Gargano up, Gargano with a superkick for two, Cesaro in, tries to knock Ciampa off the top rope, Ciampa dodges, Gargano with a rollup for two, Ciampa in, Cesaro doesn't notice, Ciampa with a rollup for three. Asuka hits the ring for an interview. Kayla: "Asuka, you are one of the most formidable Superstars in WWE history. The longest undefeated streak of any champion in NXT, the winner of the first Women's Royal Rumble, and now, a year later, Smackdown Women's Champion. But lately it seems like more people are talking about Raw Women's Champion Ronda Rousey. Do you feel lost in the shuffle?" "I feel ready for new challenges. I beat Becky and Charlotte at TLC, I made Becky tap out at Royal Rumble, I don't want to talk about Becky and Charlotte. I want to know who's ready for Asuka right now!" Mandy Rose comes out with Sonya. "Aww, poor Asuka. No one is paying attention to you. Here's a little advice: why don't you take some notes from God's Greatest Creation, the most magnetic, the most irresistable, and the most talked-about Superstar in WWE. So if anyone's ready for Asuka, it's me." Lockup, Mandy with a side headlock, Asuka punches her way out, dropkick for one, Lacey Evans' music hits, and she comes out, poses, has a staredown with Sonya, walks back off, Mandy with a shove to the corner, Russian leg sweep for one, bails to the floor, Asuka yells at Mandy, who climbs back in the ring, hits knees, throws Asuka down, Asuka with kicks, Mandy tosses her to the corner, Asuka tosses Mandy to the floor, commercial. Back on air, Asuka has a kneebar in, Mandy makes it to the bottom rope, both women to the floor, Mandy with a knee, Asuka beats the count at 9, Mandy with stomps, shoves, slaps, Asuka with a slap, more slaps, whip to the corner, reversed, Asuka leaps to the top rope, missile dropkick, spinning back elbow, another, spinning back kick for two, back suplex, Shining Wizard for two, kick to the face, Mandy screams that her eye is hurt, tosses Asuka into the middle rope, rollup for three. Backstage, a new interviewer asks Charlotte about the recent altercations with Becky Lynch. She says that Becky is like a ghost, and she's a non-factor, and needs to accept that the Wrestlemania main event will be a one-on-one. Miz approaches Shane backstage and thanks him for making the rematch. He says his dad will be ringside at Fastlane. EY wrenches an arm, Ricochet reverses, arm breaker, snapmare, EY goes for a triangle, break, EY with a side headlock, Ricochet whips out, EY with a shoulder tackle, whip, Ricochet floats over, head scissors, dropkick, EY to the floor, Ricochet feigns a suicide dive, backflips into the middle of the ring, punches, whip, EY holds the rope, Ricochet with a shoulder tackle, EY punches him to the floor, back in the ring, kicks in the corner, hangman hold, top rope knee drop for two, wrenches the neck, chinclock, Ricochet punches his way out, EY tosses him to the corner, charges, Ricochet dodges, palm strike, another, hurricanrana, shoulder tackle, springboard European uppercut, running shooting star for two, fireman's carry, EY blocks, Ricochet with an elbow, tosses Young to the apron, EY with an elbow, Ricochet with a dropkick, EY falls on the floor, Ricochet with a springboard kick to the interfering Wolfe, suicide dive to Young and Dain, rolls Young into the ring, swinging kick from the apron, goes up top, 630 for three. Kayla asks New Day about Kofi's epic performance last night. Xavier Woods says this wasn't a rapid ascension to the top, it was 11 years of great work. Kofi says this has been huge, and it was all possible thanks to his brothers in the New Day pushing for him to be the one in the Elimination Chamber. He says the momentum is just getting started. Daniel Bryan grabs a mic before the match started and runs down the crowd for being the same kind of small-minded skeptics who have held down great thinkers for all of history. He says his opponent for Fastlane won't be any of the men in the match tonight, because he already beat them. Kofi and Bryan start off, Joe in immediately, lockup, Joe tosses Kofi to the corner, Kofi ducks, kicks, whip, reversed, Kofi with a dropkick for one, arm wrench, Jeff in, top rope elbow drop, whip, reversed, Jeff with a clothesline, inverted atomic drop, leg drop, dropkick for two, Twist of Fate, blocked, Joe tosses him down, Orton in, drags Jeff to the corner, stomps to the legs, stomp to the gut, Bryan in, front facelock, roundhouse kicks, last one connects for two, Orton in, chinlock, Jeff powers out, Kofi in, clotheslines, dropkick, Boom Drop, tosses Bryan to the floor, clotheslines Orton over the top rope, goes up top, Bryan shoves him off the top rope, Joe knocks AJ off the apron, Orton back suplexes Kofi into the announce table, commercial. Back on air, Bryan is pummelling Kofi with mounted punches, slaps, Orton in, tosses Kofi to the floor, another back suplex into the announce table, rolls Kofi into the ring for two, chinlock, Kofi elbows his way out, Orton with a punch to the back, whip to the corner, Kofi tosses Orton into the ring post, Bryan in, AJ in, AJ clears the opposing corner, blocks a back suplex from Bryan, hits him with a backbreaker, Ushigoroshi for two, calls for a Styles Clash, Orton goes for an RKO, blocked, AJ hits an enziguri, Bryan with a kick, AJ rolls him into the Calf Crusher, Joe breaks the hold, eats a Twist of Fate, Orton tosses Jeff to the floor, AJ tosses Orton ont of the ring, Bryan with a rollup for two, reversed into a rollup for two, Bryan locks in the LaBell Lock, AJ makes it to the rope, ducks the running knee, hits a Pele Kick, Kofi in, springboard clothesline, Bryan presses him to the floor, Kofi lands on everyone, forearm to Bryan, missile dropkick, Bryan lands on the floor, Kofi with a stage dive to Bryan and Rowan, Trouble in Paradise for three. Don't give us Bryan vs. Kofi at Fastlane. Give it to us at goddamn 'Mania. This has potential. Shane comes out. "Alright, alright! That was an amazing match! Miz and I won't be the only ones competing at Fastlane. 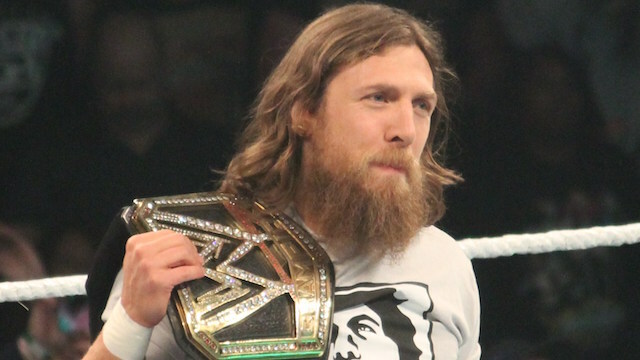 Daniel Bryan, you will be defending your championship against... Kofi Kingston!" Come on, Kofi, make us all believers.